Oval Address Number Sign, Wall Lawn Mount - - features a picture frame style border and tall 4" numbers. Made in USA. 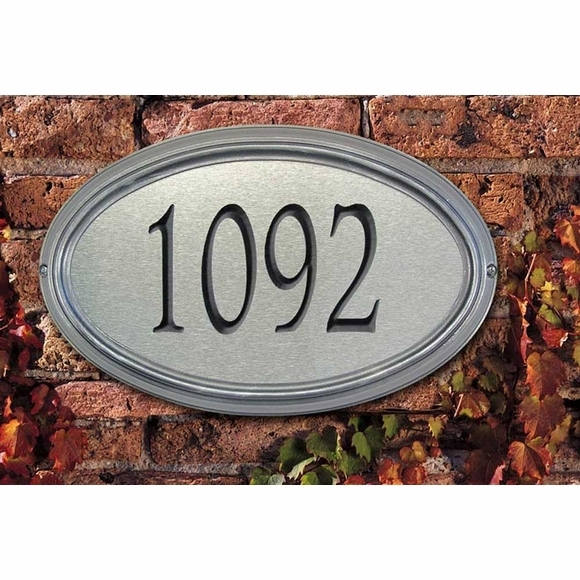 One-line house custom house number plaque is available for lawn or wall mount. Holds five 4" black numbers. Dimensional two-tone frame accents the oval shape. Two color combinations: brass & bronze with black numbers and silver & pewter with black numbers (shown above). House number sign with 4" numbers and distinctive dimensional border.